Some new graduates worry about getting their first job out of college. But not Elizabeth Hammond, ’16. Not only does she have a position, but the boss adores her. After all, he’s her dad. Hammond’s returning to her home in Ghana to become her father’s professional assistant at the bank where he’s the CEO. She’s looking forward to working with him while also fulfilling a Ghanaian government requirement to return for one year after completing an undergraduate degree abroad. “I’m killing two birds with one stone,” Hammond says. She’ll use her major in strategic communications to provide information to the press and communicate with her dad’s business partners. With her minor in information systems, Hammond hopes to make an even more significant impact. The bank’s website — like most websites in Ghana, she says — isn’t user-friendly and doesn’t translate well to mobile devices. She hopes to bring it up to speed with those of American companies. After a year, Hammond plans to return to the U.S. for a master’s in communications. When she’s finished with that degree, she’ll return to Ghana for good. There, she’d like to become a public relations guru, to further what she sees as a lagging profession in her country. Hammond’s ultimate goal is to start a consulting agency to help international students navigate choosing and attending college in the U.S. or other countries. She knows first-hand what it’s like to have no help with such an important decision. “I picked Maryville from Google. I didn’t have anybody saying, ‘This is the right fit for you,’” she says. 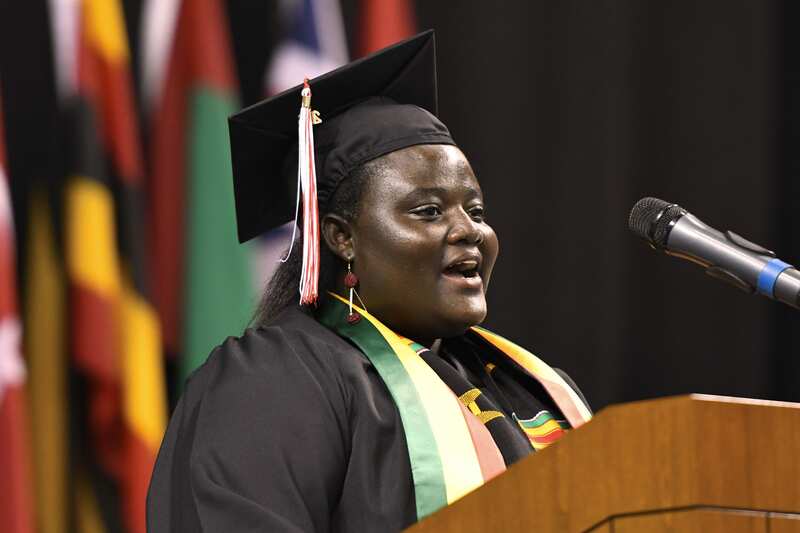 Luckily, Maryville’s small size and friendly, student-centered campus turned out to be perfect for Hammond, whose accomplishments include reviving the African Students Association. She anticipates a meaningful year ahead of reconnecting with her family, which includes 15 brothers and sisters. In the meantime, she can’t wait to enjoy the Ghanaian weather, which is quite different from that of St. Louis. “Constant warmth and no snow,” Hammond says. Hammond was one of two student commencement speakers this spring (see Allie Patton, ’16). “Today we are here because we have climbed a mountain and have successfully made it to the peak without passing out! Maybe some of us needed extra oxygen along the way, but most importantly we made it! On our journey, we met people who touched our lives. Some of us have become more diverse and come to understand how globally connected the world has become. We have learned to be patient (like with that one person who takes up all the washers and dryers in the laundry room). We have learned teamwork and leadership (free t-shirts and food is the secret to making any event on-campus a success); but most importantly, our experiences were intertwined, and that is what Maryville is all about—great, life-changing experiences. In my three years here, I have experienced a lot of things; some of which I know in my heart I would never try again. I know I will never go ice-skating again and I truly appreciate God for not creating snow in Ghana. On the other hand, there are some things that I know will forever be a part of me. I will always cherish my time working with the African Student Organization to introduce our culture to the Maryville community. This experience was so impactful for me that I ended up changing my major from forensic science to communications, because I found my passion through organizing events and creating a home away from home for the African students on campus. These memories make me feel sentimental about leaving the wonderful faculty and staff members who lifted up our spirits with their smiles and caring thoughts and because of the mentors who went out of their way to teach us how the world works.